Gingivitis & Periodontitis is very common Dental problems, associated with bleeding gum which I have seen in my daily practice. Bleeding gum causes bad breath or bad smell from the mouth; if you are getting these problems then immediately visit a dentist. If you are having gum bleeding, then it can be cured. An early stage of gum disease cause swelling of gum & later it can cause pigmentation or black sport on gum, if not treated that it can cause bleeding gum & then a periodontal problem, loss of a tooth. Gum or Gingiva is the supporting & which surrounding tooth. Gum disease, also known as Gingivitis & Periodontitis, is an infection of the gums that surround the teeth structure. It is also one of the main causes of bleeding gum & tooth loss among adults. 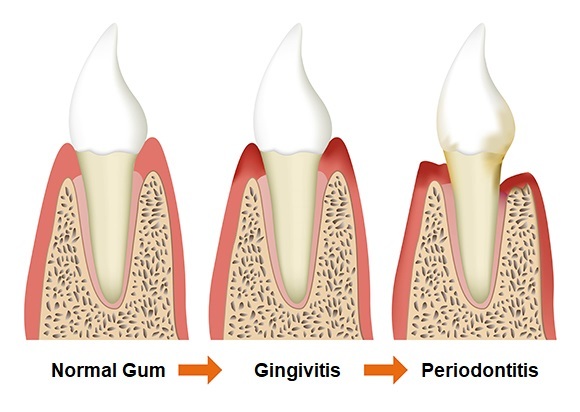 There are two major stages of Gum disease: Gingivitis and Periodontitis. 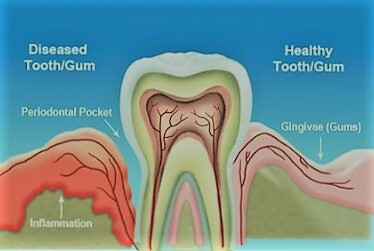 Gum disease can increased space in between tooth, causes increase gap in between tooth. If this problem is untreated it can cause tooth loss. Gum disease can be caused by a number of factors, but poor oral hygiene is the most common cause. Mainly Dental Plaque & Calculus causes Gum problems. Your mouth is full of bacteria that combine with saliva to form a sticky film known as plaque, which builds up on your teeth. This plaque later becomes hard on the tooth, its call Calculus. When you take food or drink high in carbohydrates (sugary or starchy foods), bacteria in plaque turn carbohydrates into the energy they need, producing acid, this acid causes irritation of gums, making them inflamed & gum disease. What is Dental plaque & Calculus? Plaque is the soft depositions that form the biofilm adhering to the tooth surface or other hard surface in oral cavity. Dental Calculus is an adherent, calcified or calcifying mass that forms over the tooth structure & dental appliance. The plaque later on becomes the dental calculus. Periodontal infections are usually mixed, most often involving anaerobes such as Treponema denticola and Porphyromonas gingivalis. The microaerophile Actinobacillus actinomycetemcomitans causes a rare form known as localized Juvenile Periodontitis. Weakened immune system – HIV and AIDS or certain, Malignancy. Increased Space or gap between teeth, it can cause food impaction & later it may lead to infection & caries. Stick to gentle, twice-daily brushing with a soft bristle or electric brush, use proper toothpaste. Use proper toothbrush & toothpaste. Use Floss once daily & you can massage gum with your finger. Chewing habit of little hard & fibrous food is a good habit; don’t take always soft or liquid food. If you will chew then blood circulation on gum will increase & you can get healthy gum. Take balance diet. Schedule regular dentist visits for plaque and tartar removal. Every 6-month visit Dentist for scaling treatment, for prevention of gum problem. If you are having the orthodontic problem (Malocclusion) you may affect with poor oral hygiene & gum problem; then get the Orthodontic treatment. Antiseptic mouthwashes containing Chlorhexidine is given or Betadine gargle is recommended. 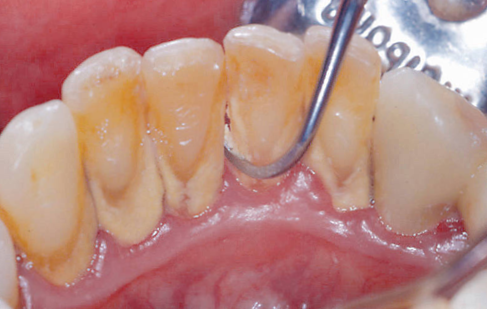 Oral prophylaxis(Scaling) for gum disease or Root planning needed for Periodontics. For Gingivitis & Periodontist Scaling is the primary & important basic treatment to remove the causative factor Plaque & Calculus. If you have severe gum disease, you may need further treatment, such as periodontal surgery. In some cases, it’s necessary to remove the affected tooth. Commonly Antibiotics like Metronidazole, Doxycycline, Amoxicillin is used upon the condition, a painkiller used to reduce pain. Take medicine after dentist advice. For severe Periodontal, a problem Surgical Interventions needed: If none of these other gum infection treatments works, your dentist may recommend surgery. There are several surgery options, including a gingivectomy, flap procedure or even a tooth extraction. Conclusion: Bleeding gum can be cured, don’t neglect it, immediately visit Dentist. Maintain Oral hygiene, at least every year get Scaling treatment, use proper mouthwash, brush twice daily & don’t use a hard brush, the electric brush is also good. Every 6-month visit Dentist for scaling treatment, for prevention of gum problem. I give one suggestion every time don’t eat soft or liquid food, Chewing habit of hard & fibrous food is good for your gum. The habit of Chewing improves the blood circulation in gum, gives you a healthy gum. Don’t take tobacco.